A blanket of dense fog and a dark sky loomed over Sausalito’s harbor on the morning of our all-female adventure. Twenty-one salmon rods were rigged and strategically placed in their rod holders from bow to stern of our charter boat. As the lights in the bay twinkled about, freshly brewed coffee, baitfish and salty air permeated my nose, and I thought to myself that these are the smells that memories are made of. I looked around the deck of the boat and saw 20 like-minded female anglers all bundled up in jackets, hats and boots ready to greet the day. As we sipped our coffee and tried to shake our Dramamine grogginess, we introduced ourselves and organized our gear. I smiled as I listened to quiet conversations and laughter taking place around the boat. While the boat was pulling out of the harbor, I gazed up at the world-famous Golden Gate Bridge – breaking through the morning fog in all its glory, towering so grand above us. The steady hum of the boat’s motor was hypnotic as it rumbled along quietly along while we made our way to the first fishing spot. We carefully dropped our baited rigs into the deep blue waters while tiny wakes formed behind our lines as we trolled along in the calm seas. Our baitfish and flashers danced in the dark of the Pacific, all trying to entice a hungry king. Our group intently watched their rod tips as the cool moist air chilled our faces and kept us bundled up while we soaked up the beauty that surrounded us. The calmness of the sea, the mild rocking of the boat and the peaceful lapping of the water had me in a blissful state. And then I saw it – the unmistakable tap of my line – I yelled, “Fish on!” and it was as if the ball had just dropped on a New Year’s celebration and 20 bottles of champagne had been popped all at the same time! The first legal king salmon came over the rail and you would have thought the girls had been friends forever. Hoots and hollers, high-fives and smiles were in every corner of the boat as we all whooped it up together. And so began one of the best all-female adventures I have ever been blessed to be a part of. 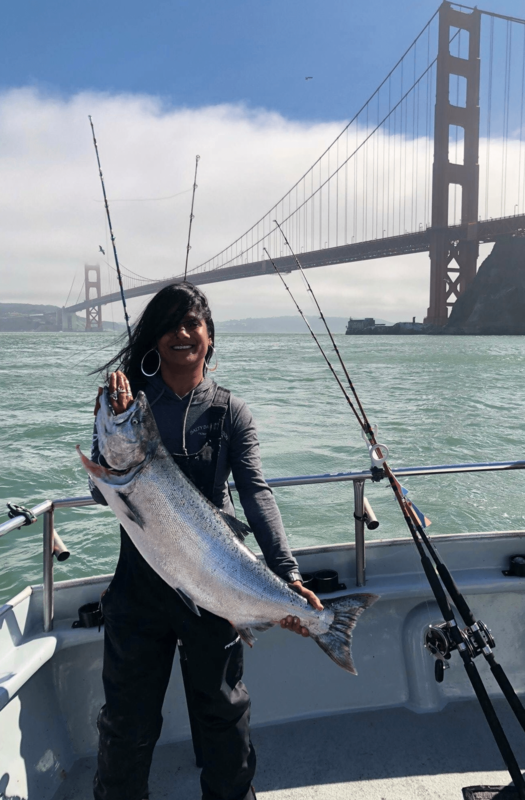 WHEN I WAS FIRST notified about the Golden Gate Salmon Association’s first-ever “Fish Like A Girl” all women’s salmon fishing trip, I couldn’t say yes fast enough. I reached out to my 18-year-old niece Audrey to see if she was interested as well and her response was the same as mine. 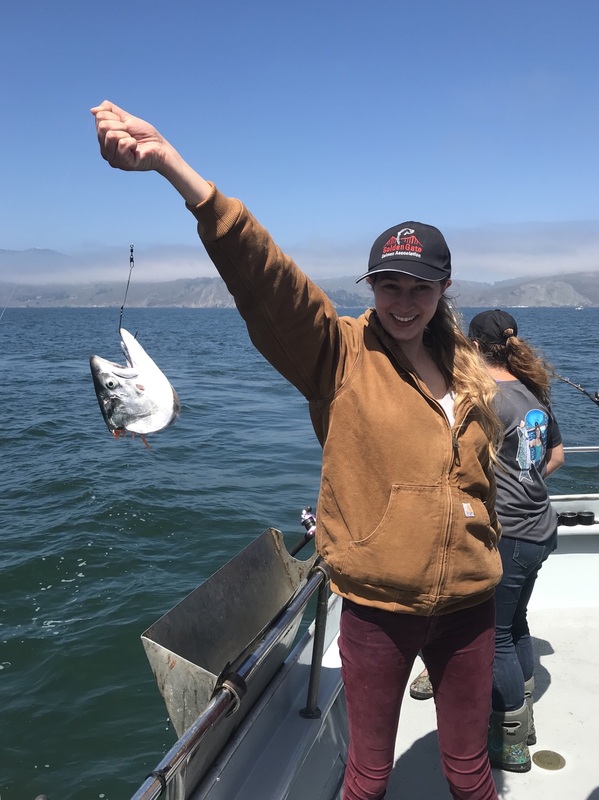 While anxiously waiting for the day of the charter to arrive, I made contact with Cat Kaiser, who not only is GGSA’s fundraising and events coordinator, but one heck of an angler (or “anglerette,” as we like to call it!). I was thrilled to be in contact with her and so looked forward to meeting another diehard female angler in California. She was so helpful with my travel plans and any needs or questions I had before our trip. When I first met her it was as if we were long lost friends; I knew she was someone that I wanted to both be around and definitely fish with! The salmon charter boat we were aboard, the Sausalito-based Salty Lady, was perfectly named for our fishing party. Jared Davis was our incredible, hard-working captain with two enthusiastic and beyond fun deckhands Tommy Watson and Jimmy McNair. Capt. Jared acquired the 56-foot fishing boat from the estate of a salmon fishing icon named Roger Thomas at the beginning of this year. Jared originally was a hired operator on the Salty Lady and worked with Thomas for close to 20 years. Thomas was the president of the Golden Gate Fishermen’s Association and the chair of the board of directors with the Golden Gate Salmon Association. Sadly, he passed away last December. When Jared spoke to me about Thomas, it was with complete admiration and an obvious deep friendship. It was apparent that his heart was still heavy for his and the industry’s loss, but I know he will do a great job taking care of the Salty Lady and her guests. Jared certainly took great care of us and made sure we were safe, having fun and catching fish! Also aboard our vessel was Mike Aughney, who helped out the ladies onboard immensely. Mike is the owner and editor of USAFishing.com, a GGSA executive board member volunteer and a seriously knowledgeable and passionate salmon advocate. We had a great conversation and I learned a lot about the salmon industry from my time spent with him. I couldn’t have asked for a better group to hang out with for the day. AS THE HOURS AND miles drifted by, my throat became hoarse and my hand sore. 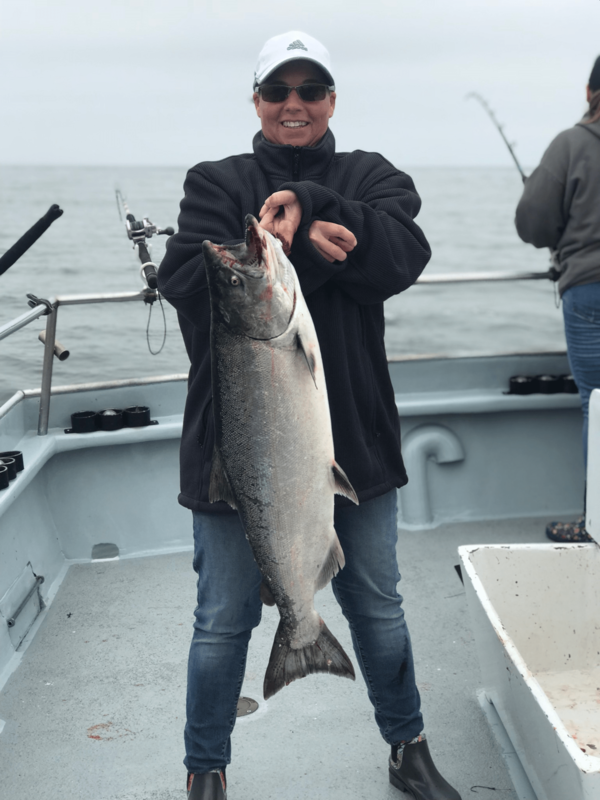 These feelings weren’t brought on by the cold or a strained tendon; it was from hooting and hollering and endless high-fives from salmon after salmon being brought onto the boat! These women certainly could fish! The 21 women on our boat (including me) were from all over California. And the coolest part was that some had never caught a salmon, and a few had hardly wet a line before this day. Talk about excitement! Cat and GGSA seriously spoiled us with breakfast, lunch, drinks and even chocolate! We all received GGSA hats and shirts and some of us were even lucky enough to leave with dinner: freshly caught salmon. The fishing gear was well maintained and the boat was in tiptop shape – spotless and it even had two heads. With each “Fish on!” yelled from bow to stern, the ladies’ excitement grew and grew. Jessy’s fish was an inpromptu meal for a hungry sea lion. We were blessed by several whale sightings and not so blessed when one very clever sea lion decided he needed one of the anglerettes’ salmon for lunch! 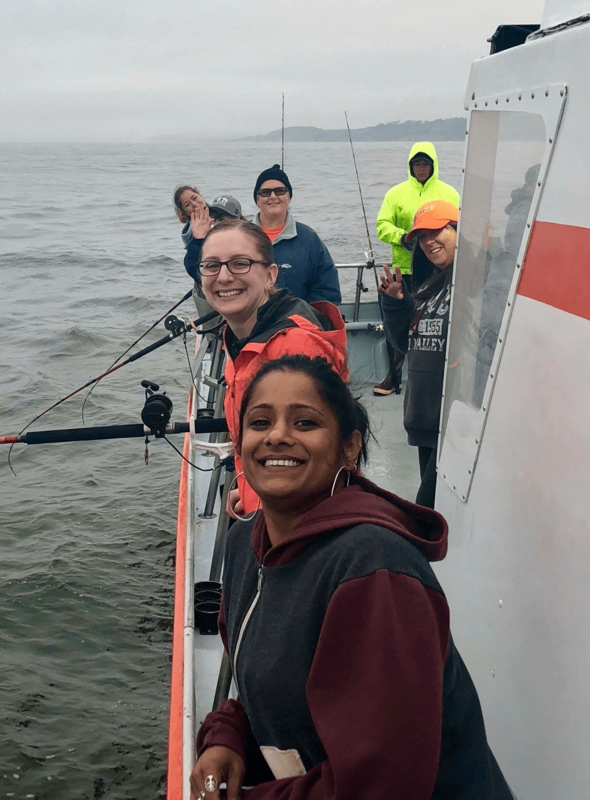 We all had a laugh and raised our fists when Jessy pulled up nothing but a salmon head on the end of her line while the sea lion gulped down its tasty meal. Event organizer Cat Kaiser of the Golden Gate Salmon Association (left) and author Nancy Rodriguez. IT’S HARD TO EXPLAIN how much support was felt on this boat. I have been around men who will say “Nice catch” or “Good job,” but there is no comparison to the support and encouragement women give to each other. As we all started to get to know one another, the cheering grew louder. We even cheered on neighboring boats that we would see fighting a fish. How fun is that? As the sun started to break through the coastal fog, Capt. Jared held strong in his desire to put his ladies on some fish and make this one of the best day’s on the water they’ve ever had. The ladies ended up bringing home 16 fish, with many smaller salmon (future dinners) caught and released, as well as a few kings lost. My niece even landed a silver, which was admired and quickly returned to the sea. The crew of the Salty Lady went above and beyond any of my expectations and I would be thrilled to go out on the boat again. I will forever have fond memories of the GGSA salmon fishing trip. I made new friendships and met some amazing people on our adventure together. It was my first trip with 20 other like-minded women who all share the same passion and hope there are many more to come. Cat Kaiser and GGSA put on a fantastic event. 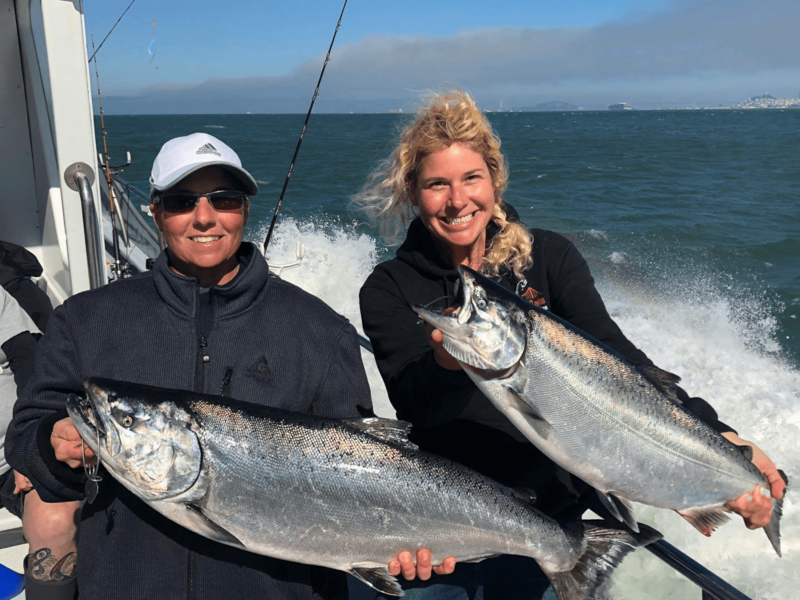 They truly are the people working so tirelessly to ensure the fact that future generations will have an opportunity to fish for the mighty Chinook salmon in our golden state. 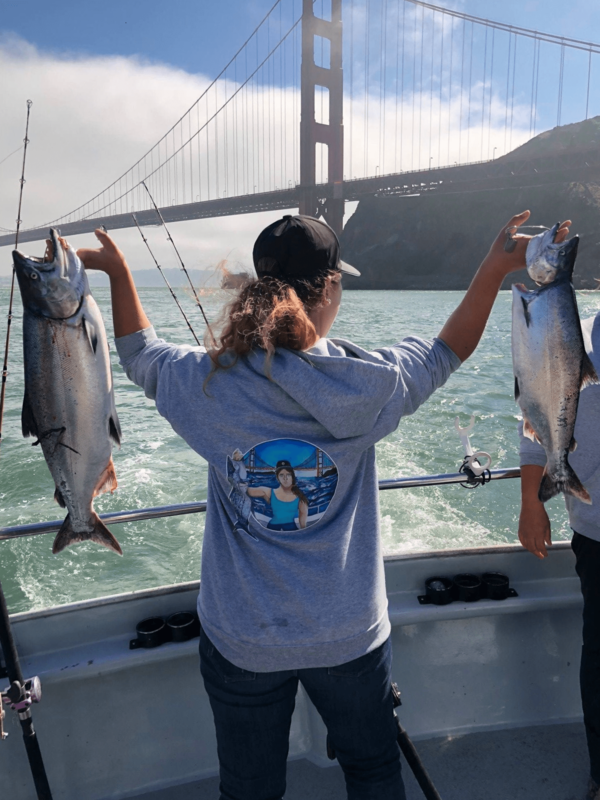 If you’d like to learn more about California’s salmon industry and fishing for these beautiful fish, I hope you look into joining GGSA and keep an eye out for future fishing trips. Editor’s note: Nancy Rodriguez lives in Cool (El Dorado County) with her husband Joe. She is on the field staff for Prois Hunting Apparel and a brand rep for Rockstarlette Outdoors and enjoys inspiring women to get outdoors. 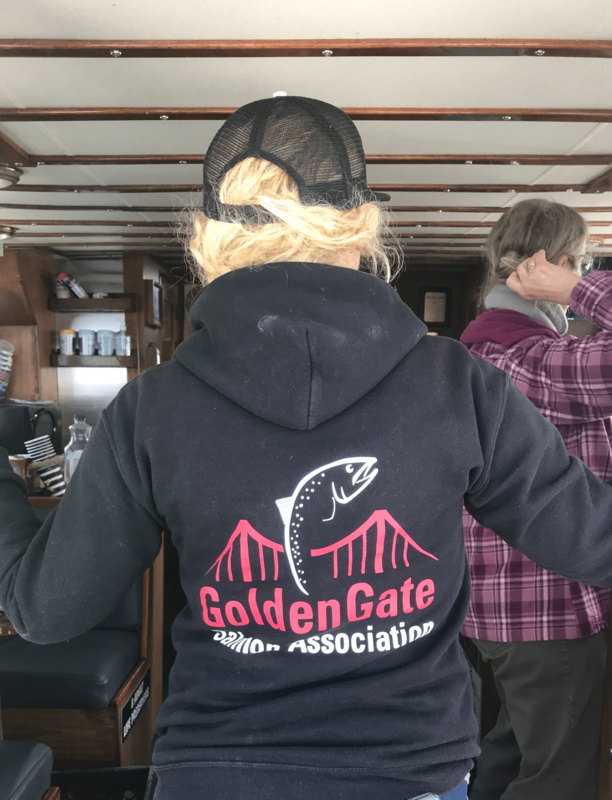 I have to admit, I didn’t know much about the Golden Gate Salmon Association before the trip. I looked up GGSA’s website (goldengatesalmon.org) and was instantly impressed. If you are an angler or hunter in California (or any state for that matter), you know how important conservation is, which is exactly what this organization is all about. GGSA is a coalition of salmon advocates who work hard to protect our salmon and the industry that is so important to our home state.